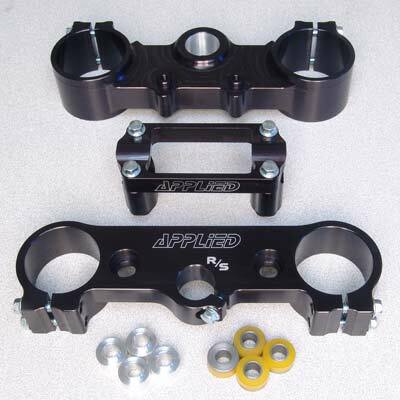 These sets are completely CNC machined from 6061 and 7075 billet aircraft quality aluminum, for superior strength and durability. 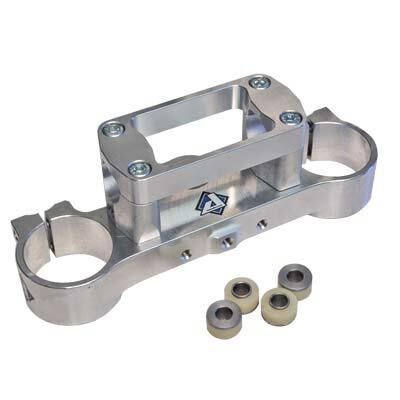 Fork bores are precision machined for a perfect fit and greater clamping surface to reduce fork flex. Bar mounts are reversible to allow for stock bar position, or a more forward and aggressive position. Optional height bar mounts are available. The sets include Upper and Lower Triple Clamps, bar mounts, one-piece top strap, and all the necessary hardware. The set fits all 2010-2011 SX / XC / SXF 125 to 450cc. Applied clamps are made in the USA in our own facility, and have a lifetime warranty to the original purchaser.